When the days get pleasantly sunny and the evenings are balmy and warm, we seize the opportunity to make the most of our outdoor spaces with parties of every kind. But if you’re working with a tiny yard or an apartment patio, you might be feeling some serious backyard envy right about now. Never fear, just because you don’t have space for a pool and an outdoor kitchen and a giant hammock doesn’t mean you can’t entertain outside. 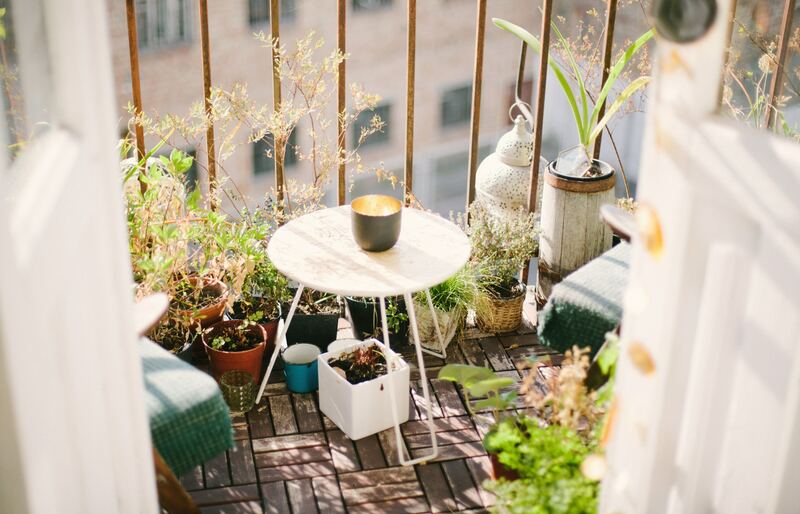 With a bit of thoughtful design, you can turn even the smallest outdoor space into a little slice of paradise. The selfie-savvy know, the right lighting is everything. Nothing is more effective at setting a mood and adding a little drama or enchantment to a space. Whether you opt for the whimsy of string lights or the primal call of an open flame, adding some special lighting to your outdoor space will make all the difference in setting a party mood. Plant life can do a lot to soften a space and make it feel lively and welcoming. Not only can you add as much color as you like, certain herbs and flowers will provide the added dimension of scent. If you don’t have the room or the access to plant directly, some well-placed and well-cared-for potted plants can create a lush landscape even in a small space. If planting beds and grassy lawns aren’t an option where you live, that doesn’t doom you to staring at a bland concrete slab. Define an outdoor sitting area or inject a little color and texture with an outdoor rug. Lure your guests into your outdoor space by giving them somewhere to settle in. Even small patio, you’re not limited to a tiny bistro set (unless you want one). Benches, small lounge chairs, even outdoor ottomans can create comfortable seating with room for friends. If the view from your back door is a bummer, there are plenty of options for creating visual barriers in your outdoor space: curtains, plants, screens. But if you’re looking to do something a little different, try a tapestry. With one large, unified image you can create the perfect backdrop for the rest of your outdoor design scheme.